Year 10 have just finished their 'Structures' project. They were set the brief of researching the art of Japanese paper folding, known as 'Origami', with the ultimate task of developing collaborative outfit designs from their research. 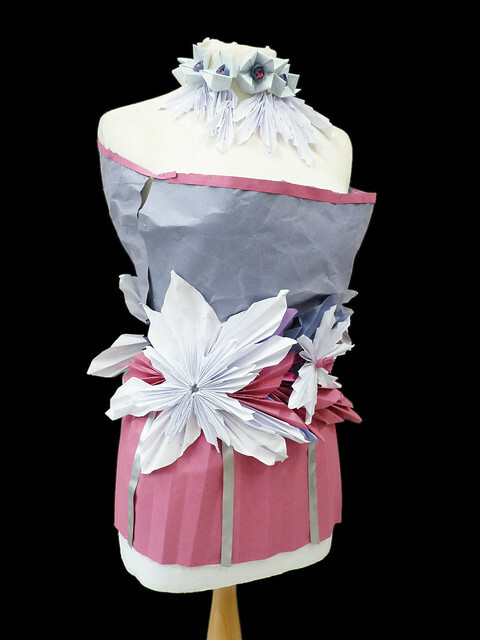 Students looked at Avant Garde paper outfit designs, enjoyed two fun and informative workshops provided by Carmel College, and watched YouTube videos to learn how to create a number of origami shapes. Next they drew out their ideas, and finally many hours of sticking, gluing and pinning followed in order to finalise their 3D creations. They are all very happy with the finished outfits.